The “Cerylonid Series” (C.S.) is a cluster of presumably highly derived families within Cucujoidea comprising Alexiidae, Bothrideridae, Cerylonidae, Coccinellidae, Corylophidae, Discolomatidae, Endomychidae, and Latridiidae. Crowson’s (1955) original concept of the Cerylonid Series included Cerylonidae, Coccinellidae, Corylophidae, Discolomatidae, Endomychidae, Merophysiidae and Latridiidae. Since then the constitution of the group has been modified via family-level refinement that was accomplished primarily by the work of Lawrence (1980, 1982, 1985, 1991). Lawrence (1982, 1991) elevated the endomychid subfamily Sphaerosomatinae to familial status (= Alexiidae), although the distinctness of Sphaerosomatinae and the need for its elevation to family status had been recognized previously (e.g., Sen Gupta and Crowson, 1973). Merophysiidae was subordinated within Endomychidae (Lawrence, 1982, 1991). The subfamily Bothriderinae was removed from the tenebrionoid family Colydiidae (= Zopheridae) and recognized as a distinct family (Lawrence, 1980; in accord with earlier suggestions by Craighead, 1920) within the C.S. of Cucujoidea (Lawrence 1980, 1985, 1991; Pal and Lawrence 1986). Although only eight families make up the C.S., the group is incredibly diverse including 39 subfamilies and more than half the genera (646 of 1,237) and species (9,600 of 19,090) of the entire superfamily Cucujoidea (Lawrence, 1991; Lawrence and Newton, 1995). It is one of the few large groupings of Cucujoidea that has been hypothesized to form a clade (Hunt et al. 2007; Robertson et al., 2008; Sen Gupta and Crowson, 1973; Ślipiński, 1990; Ślipiński and Pakaluk, 1991). Cerylonid Series beetles have exploited a wide variety of natural resources. Host utilization within the C.S. ranges from diverse forms of mycophagy (e.g., utilizing Basidiomycetes, Ascomycetes, & Zygomycetes), to phytophagy, myxomycophagy, predation, cleptoparasitism and parasitoidism. Cerylonid Series beetles are often associated with fungi or decaying plant matter. They are commonly collected in leaf litter, on vegetation, and on or under the bark of dead and dying trees. Many C.S. taxa are attracted to lights. The predaceous forms are often swept from vegetation where their prey occur. Sensory appendage of 2nd antennomere usually as long as the 3rd antennomere. Fig. 1. Sphaerosoma sp., leg. Fig. 3. Rhyzobius sp., abdomen. Fig. 2. Dastarcus helophoroides, wing. Fig. 4. Loebliorylon sp., phallobase. As reviewed by Ślipiński and Pakaluk (1991), the above suite of defining characters for the C.S. is somewhat problematic. For instance, many of the characters used to recognize the C.S. are reductions. Other proposed synapomorphies are widespread in unrelated groups (e.g., aedeagus resting on side when retracted occurs in other cucujoid families) or are lacking in some C.S. taxa (e.g., a well developed phallobase occurs in Coccinellidae; a closed radial cell occurs in the bothriderid genus Deretaphrus). Furthermore, the use of larval characters is problematic because so few C.S. taxa are known in their larval stage. Several studies of the classification of the Cerylonid Series have been provided (e.g., Pal and Lawrence, 1986; Paulian, 1988; Sasaji, 1987; Sen Gupta and Crowson, 1973; Ślipiński and Pakaluk, 1991); however, until recently (see below) none was based on a formal phylogenetic analysis. Ślipiński and Pakaluk (1991) reviewed the classification of the C.S. and pointed out many serious problems and expressed concerns about the present family limits and the lack of resolution within the C.S. Two molecular phylogenetic studies including C.S. taxa have recently emerged: Hunt et al. (2007) and Robertson et al. (2008). Hunt et al.’s (2007) paper focused on reconstructing the higher-level relationships within the order Coleoptera using 18S, 16S and COI and a broad taxon sampling across all major beetle groups. While investigating the relationships among C.S. taxa was not the primary goal of their study, Hunt et al. (2007) did include 21 C.S. taxa in their 320 taxon analysis and recovered the C.S. as monophyletic. While Hunt et al.’s (2007) study indicates that the C.S. families Endomychidae and Cerylonidae are paraphyletic, most of the C.S. inter-familial and subfamilial clades were not resolved (Fig. 5A; see Fig. S1, Hunt et al., 2007). Noteworthy C.S. internal relationships that were recovered in this study include a sister group of Corylophidae and the endomychid Merophysiinae (as “Holoparamecinae”). Hunt et al. (2007) also recovered a well-supported clade comprising Bothrideridae, Cerylonidae and Discolomatidae (though Bothrideridae and Cerylonidae are not recovered as monophyletic) that in turn forms the sister group to the remaining C.S. taxa. Fig. 5. Hypotheses of phylogenetic relationship of Cerylonid Series taxa. (A) After Hunt et al. (2007). Fig. S1, redrawn with condensed terminals. (B) After Robertson et al. (2008) Fig. 2, redrawn with condensed terminals. The monophyly of the C.S. was also supported by the first formal phylogenetic analysis to focus on C.S. relationships, Robertson et al. (2008), a molecular analysis that included 61 C.S. taxa, representing 7 of the 8 families and 20 of 39 C.S. subfamilies. This study also supported the monophyly of many C.S. families and subfamilies, while revealing the paraphyletic nature of some higher-level taxa, including Endomychidae, potentially Latridiidae, and multiple subfamilies (e.g., Corylophinae, Chilocorinae, Scymninae). Nonetheless, it should be noted that the analysis of Robertson et al. (2008) lacked many key taxa; therefore, the monophyly and the internal relationships of multiple C.S. taxa remain equivocal. Thus although recovered as monophyletic, the tests of monophyly for the families Cerylonidae, Bothrideridae and Corylophidae were weak due to the small and unrepresentative taxon sampling included for these taxa. Notable internal relationships recovered in Robertson et al.’s (2008) study (Fig. 5B; see Fig. 2 in Robertson et al., 2008) include a sister grouping of the endomychid subfamily Anamorphinae + Corylophidae, and this clade is unresolved with the Coccinellidae clade and the clade comprising the remaining Endomychidae. This analysis also suggests a close affiliation of Bothrideridae, Cerylonidae, and Discolomatidae. The studies of Hunt et al. (2007) and Robertson et al. (2008) both suggest a basal dichotomy of two superfamilial clades: one clade comprising Bothrideridae, Cerylonidae, and Discolomatidae; the second clade includes Corylophidae, Coccinellidae and Endomychidae. Latridiidae is placed sister to the clade of Bothrideridae, Cerylonidae, and Discolomatidae in Robertson et al.’s (2008) tree, while in the Hunt et al. (2007) analysis Latridiidae is included in the Corylophidae, Coccinellidae and Endomychidae clade. Nonetheless, with roughly only half of the C.S. subfamilies represented in the Hunt et al. (2007) and Robertson et al. (2008) studies, the above hypotheses of C.S. phylogeny should be taken as preliminary. The inclusion of all C.S. families, subfamilies, and major or enigmatic tribes and genera in future studies will certainly influence the hypotheses of relationships and monophyletic taxa (e.g., monophyletic Cerylonidae in Robertson et al., 2008) and is necessary to clarify the historically problematic relationships among this diverse cucujoid lineage. Craighead, C. F. 1920. Biology of some Coleoptera of the families Colydiidae and Bothrideridae. Proc. Ent. Soc. Wash. 22: 1-13. Hunt, T., J. Bergsten, Z. Levkanicova, A. Papadopoulou, O. St John, R. Wild, P. M. Hammond, D. Ahrens, M. Balke, M.S. Caterino, J. Gómez-Zurita, I. Ribera, T. G. Barraclough, M. Bocakova, L. Bocak, and A. P. Vogler. 2007. A comprehensive phylogeny of beetles reveals the evolutionary origins of a super-radiation. Science 318: 1913-1916. Lawrence, J. F. 1980. A new genus of Indo-Australian Gempylodini with notes on the constitution of Colydiidae (Coleoptera. J. Aust. Ent. Soc. 19: 293-310. Lawrence, J.F. 1982. Coleoptera. In S. P. Parker (ed) Synopsis and classification of living organisims. McGraw-Hill Book Co., New York, pp. 482-553. Lawrence, J. F. 1985. The genus Teredolaemus Sharp (Coleoptera) in Australia. J. Aust. Ent. Soc. 24: 205-206. Lawrence, J. F. 1991. Bothrideridae (Cucujoidea). In F. W. Stehr (ed) Bothrideridae (Cucujoidea). Kendall/Hunt Pub. Co., Dubuque, Iowa, pp. 477-479. Lawrence, J. F. and A. F. Newton. 1995. Families and subfamilies of Coleoptera (with selected genera, notes, references and data on family-group names). In J. Pakaluk and S. A. Slipinski (eds), Families and subfamilies of Coleoptera (with selected genera, notes, references and data on family-group names). Muzeum i Instytut Zoologii PAN, Warszawa, pp. 779-1006. Pal, T. K. and J. F. Lawrence. 1986. A new genus and subfamily of mycophagous Bothrideridae (Coleoptera: Cucujoidea) from the Indo-Australian region, with notes on related families. Jour. Aust. Entomol. Soc. 25: 185-210. Paulian, R. 1988. Biologies des Coleopteres. Lechevalier, Paris. Robertson, J. A., M. F. Whiting and J. V. McHugh. 2008. Searching for natural lineages within the Cerylonid Series (Coleoptera: Cucujoidea). Molecular Phylogenetics and Evolution 46:193-205. Sasaji, H. 1987b. On the higher classification of the Endomychidae and their relative families (Coleoptera). Entom. J. Fukui 1: 44-51. Sen Gupta, T. and R. A. Crowson. 1973. 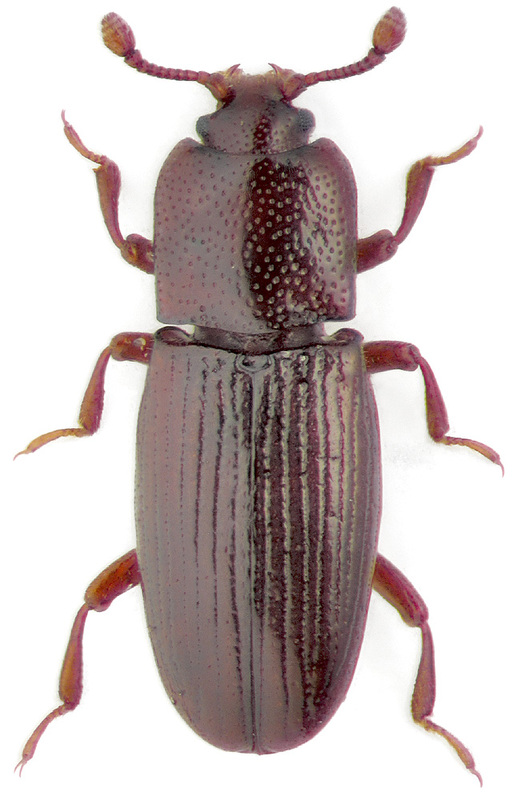 A review of the classification of Cerylonidae (Coleoptera: Clavicornia). Trans. R. ent. Soc. Lond. 124: 365-446. Ślipiński, S. A. 1990. A monograph of the world Cerylonidae (Coleoptera: Cucujoidea) Part I - Introduction and higher classification. Annali del Museo Civico di Storia Naturale "Giacomo Doria" 33: 1-273. Ślipiński, S. A. and J. Pakaluk. 1991. Problems in the classification of the Cerylonid series of Cucujoidea (Coleoptera). In M. Zunino, X. Belles and M. Blas (eds), Problems in the classification of the Cerylonid series of Cucujoidea (Coleoptera). European Association of Coleopterology. Silvestrelli and Cappelletto, Torino, pp. 79-88. Atlas of beetles of Russia – superfamily Cucujoidea. Cerylonid Series NSF PEET Project webpage. We thank all members of the McHugh lab for their assistance with this project. We especially thank Floyd W. Shockley for providing assistance with the development of this web page and for reviewing the content. Support for the construction of this page was provided by an NSF AToL grant EF-0531665 to M.F. Whiting (subcontract to J.V. McHugh) and through an NSF PEET grant (DEB-0329115) to J.V. McHugh, M.F. Whiting, and K.B. Miller. Page: Tree of Life Cerylonid Series. Authored by James A. Robertson and Joseph V. McHugh. The TEXT of this page is licensed under the Creative Commons Attribution-NonCommercial License - Version 3.0. Note that images and other media featured on this page are each governed by their own license, and they may or may not be available for reuse. Click on an image or a media link to access the media data window, which provides the relevant licensing information. For the general terms and conditions of ToL material reuse and redistribution, please see the Tree of Life Copyright Policies.